Guy Clark’s best songs are so wise, so sneakily didactic that they can seem to blow on the wind of fable. About 15 years ago, Texas troubadour Guy Clark (working with Rodney Crowell) wrote a song that, better than any other articulation you’ll ever find, conveys the way his ardent fans feel about his music. “Stuff that works," he sang, “stuff that holds up / The kind of stuff you don’t hang on the wall / Stuff that’s real, stuff you feel / The kind of stuff you reach for when you fall." Like an old favourite sweater, ragged and worn and unquestioned, each new Guy Clark record seems like it’s always been there, like you’ve known it forever. I don’t know how he does it, and I don’t think he does, either. At least, I kind of hope he doesn’t. There’s something about the mystery of genius that begs to be left alone. The Texas singer-songwriter thing that emerged in the late 1960s behind a shared fascination with Hank Williams’ rambling darkness and Lightnin’ Hopkins’ spooky honesty is, arguably, the strongest current that’s been running through acoustic music ever since. Think of the pillars of that fabled scene: Townes Van Zandt, Jerry Jeff Walker, Billy Joe Shaver, Guy Clark. Think of the second generation of the scene, the folks who studied at the feet of the first wave: Robert Earl Keen, Rodney Crowell, Lyle Lovett, Steve Earle, Nanci Griffith. You’ll be hard-pressed to track down a more accomplished, more dominant, or more storied body of interconnected musicians over the past four decades. And, if its heart was Townes, I believe that its hands belonged to Guy. 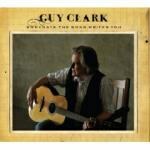 The most overused term for Guy Clark is “craftsman”, an expression once employed as the title of a double-CD reissue of three of his records from the mid-'70s and which seems to have stuck. While a bit of a vague moniker -- what is a songwriter if not a craftsman? -- the implication of handiwork, of moulding and sculpting and refining and finishing, does seem to fit. Clark’s best songs are so wise, so sneakily didactic that they can seem to blow on the wind of fable. His storytelling carries a depth of character and breadth of emotional vision that has always set them far apart from the rest. A list like “Desperados Waiting for a Train”, “The Dark”, “Texas 1947”, “The Randall Knife”, and “The Cape” seems comprised of required listening for any pretender to the craft. And that voice, that lazy drawl, that raspy swagger, like some weary preacher at home, alone, confronting his demons. Rain battering the old soggy roof. Somedays the Song Writes You, Clark’s 13th record (including a couple live ones, and not including reissues and compilations) ranks up among his best since the late 1970s. Featuring spare, farmhouse production which accentuates both voice and lyrics, this is how Clark should always sound. From the subtle reworking of the old adage about the bear and dinner that is the album’s title track to the glorious play on remorse and amends that is the closing anti-anthem (“Maybe I Can Paint Over That”), this is Clark at his tightest, at his whipsmart best; this may be his late-period masterpiece, folks. Continuing a trend that he began a couple of records ago, Clark's new album consists mainly of co-writes with friends and longtime collaborators. However, in a fascinating move, a few of his writing partners here -- Patrick Davis, Jedd Hughes and Ashley Monroe -- are young unknowns with whom Clark seems to be pushing into new territories. In a recent interview, Clark explained his thinking behind hooking up with a younger cohort: “I used to write exclusively by myself. I really enjoy writing with other people. One, I learn a lot musically. Like Jedd [Hughes] is a fantastic guitar player. He comes from a whole other place and comes up with stuff that I would never think of doing or exploring. And I really enjoy that part of it.” But, don't anyone worry that these new ideas are stripping anything away from the expected Guy Clark approach. This record is the old man through and through. Featuring a loving cover of Townes Van Zandt’s “If I Needed You” (like many of Van Zandt's friends, followers and acolytes, Clark includes a song by his old buddy on most of his records) and maybe the best pair of lines he’s ever written ("And I have stumbled in my time / I left my footprints down the road / And the part of me that shines / Ain’t the part of me that shows”), Clark has served notice that he’s still here, and that those old hands haven’t yet gone still. Stuff that works, indeed.